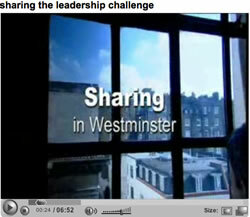 The UK Government have put two of their videos up on YouTube – for all the world to enjoy. Senior executives at the UK Cabinet Office have posted their first two short films – ‘Transformational Government‘ and ‘Sharing the leadership challenge‘, a slightly longer clip concerning Whitehall plans to save money by consolidating service departments and the leadership challenges this poses for managers. I know, I know … given that description, you all want to shoot over to the see them without a delay, but stay with a little while longer. Is this the death knell for YouTube? How could a service be any less cool than to have the government using it? The truth is, of course, that YouTube welcomes all no matter how stiff the video provider. YouTube is becoming a cross-section of society, globally. This is borne out by Peter, the self-declared geriatric1927, the 78 year old widower, living alone in the county in the middle of England. His twelve videos documenting events of his life have been watch over half a million times in the last two weeks. For a long time Governements have been looking around for way to get their ‘messages’ out to the public without the bothersome annoyance of journalists asking difficult questions. They may see YouTube as the fix for this. What they may not have taken account of is the video replies or text comments that people can leave in response.